Recipe submitted by Beverly Lybrand, Vice President & General Manager of HPV Franchise, Merck. Since your birthday only comes once a year, indulge yourself and your soul with this amazing cheesecake. With ingredients such as non-fat cottage cheese and light cream cheese, you can stay focused on your special day. 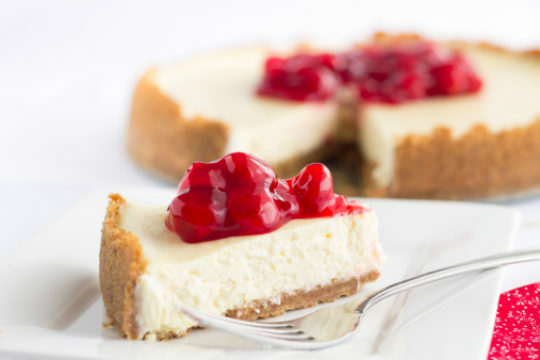 This cheesecake is simple to make but still has loads of wonderful flavoring. Topped with cherries, this dessert is definitely something to celebrate! Preheat oven to 325 degrees. Lightly coat a 10-inch spring form pan with canola oil. In a medium bowl, combine graham cracker crumbs and applesauce. Mix well. Press into the bottom of spring form pan. Set aside. Bring 1 cup of water to a boil in a small saucepan. Add vanilla bean and simmer until softened, about 1 minute. Remove bean from water and when cool enough to handle, slit bean lengthwise. Scrape out vanilla bean paste with a knife and reserve. In a blender container, puree cottage cheese until smooth. In a mixing bowl, combine pureed cottage cheese, cream cheese and yogurt cheese and blend with electric mixer on high until smooth, about 2 minutes. Add eggs, one at a time and blend well. Add flour, sugar, vanilla bean paste and vanilla extract. Blend well. Pour into crust. Bake for 40 minutes. Turn off heat to oven and allow cheesecake to cool slowly in oven for 30 minutes more. Remove from oven and let rest for 20 minutes before refrigerating. In a medium saucepan, combine cherries with sugar and bring to a boil. Reduce heat and simmer until sugar is dissolved and cherries begin to break down, about 10 minutes. Add water, if necessary, to keep from scorching. When cheesecake is cold, remove spring form sides and slice into 16 portions. Serve 1 tablespoon of cherries over cheesecake.